Indian Bhau, you just might be right. The hands of the Congress-wallahs have become very dirty, from all the looting and the scams. No wonder the Lokpal Bill has been gathering dust for 40+ years. BTW, are you participating vigorously in Sri KCR's bandhs and agitations? So if a state is created , how much cash gets generated? And who does it go to? now...that deserves totally a new thread. If BJP comes to power in Delhi, then it becomes much easier to form separate state. BJP doesn't have a base in Andhra or Telangana, so they don't have to do any complex calculations of how it will affect their future electoral prospects. No cash generation. Just we will have two CMs instead of one. May be Sri KCR will take the credit and become CM, if a separate state is formed. He's got his puttar active too in his party, just like the rest of our Bharatiya netas. Anyone from Team Anna needs a thrashing anyways! Fuckers talked of anti corruption and are campaigning in states where Congress had won last time. But these charlatans dont campaign anywhere a BJP candidate is contesting elections. Go dig up my posts from earlier on. I knew it that Anna and his team were RSS stooges using Lokpal as an excuse. Kejriwal and Sisodia and the rest have political ambitions and have used a gullible and naive Anna Hazare. I knew Anna was upto no good but decided to give him a chance. But with their latest 'ONLY ANTI CONGRESS" campaign its clear that Anna is a dyed in the wool FUGGA CHADDI. If hostage takers like him are allowed to win and come to power, then Saffron Terror is a given reality. And yes this Bhushan needs to be thrashed. Well, this, particularly the bold one was actually prophetic. The man who assaulted Prashant Bhushan deserves a LS ticket from AAP.. just like this guy here..
A man, who hurled a shoe at Finance Minister P Chidambaram in 2009, has been chosen by the Aam Aadmi Party to contest the Lok Sabha elections. Jarnail Singh is among the 20 candidates announced by AAP on Sunday. "I had applied for a ticket from West Delhi, and I was informed about my selection today," Singh said. In April 2009, Singh, a journalist with a national daily then, had hurled a shoe at Chidambaram, who was then the Home Minister, in protest against his remarks on the clean chit to Congress leaders in the 1984 anti-Sikh riots case. "He (Chidambaram) had said he was happy that his friends (Sajjan Kumar and Jagdish Tytler) were exonerated. I was unhappy over this because he was the Union Home Minister then, and such words did not suit him. "So, in a press conference at the AICC office, I asked him about his comments to which he responded that I was using the forum (press conference) for my agenda," Singh said. Upset over this, Singh hurled a shoe at the minister as a "symbolic protest". "It did not hurt him. It was just a symbolic protest," Singh said. After the incident, Singh received several requests from parties to contest, but he declined the offers as he did not want to enter politics then. He was, however, impressed with AAP's slogan of clean politics. "Arvind Kejriwal joined us in our protest (seeking justice for anti-Sikh riots victims) and assured us that his party would form an SIT to probe the anti-Sikh riot cases if it comes to power," he said. "I have been associated with the party since May 2013. 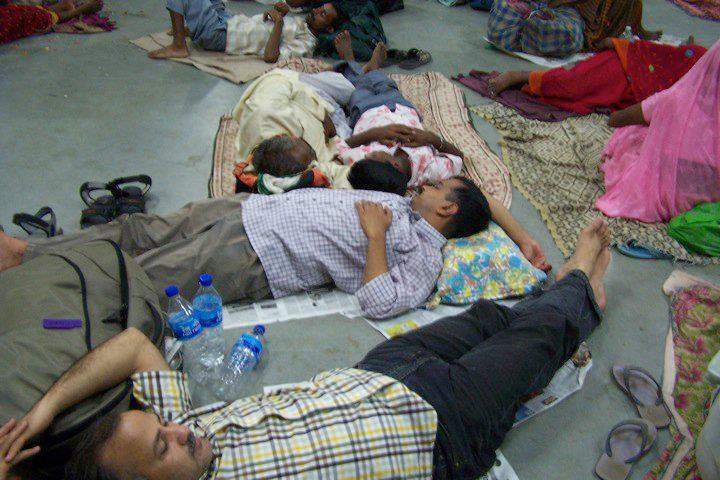 I have told him (Kejriwal) that I will do any service to the party...even if it is the job of a watchman," he said. Singh currently works as a freelance journalist and has authored three books on the 1984 anti-Sikh riots and is also working on a documentary. He also works for the victims of the anti-Sikh riots and has been instrumental in getting the children of the victims married. On campaigning plans, he said his focus would be on Sikh-dominated constituencies in West Delhi. "There are some three to four Sikh-dominated segments in West Delhi," Singh said, adding that there will be party meetings tomorrow after which the campaigning will start. The West Delhi constituency has a sizable chunk of Poorvanchali population and is currently represented by Congress leader Mahabal Mishra. AAP members are first class hypocrites. My boodhi aankhen cannot make out much (particularly after good amounts of Heineken and Tecate) But is that Sisodia or Kejri? Looks like things have come back a full circle after a 2 Cr allegation against Kejri. Both of them are there in that pic.